Time for the December giveaway! I will be drawing for a free crocheted item of the winner's choice from my Etsy shop! It is easy to enter, just leave me a comment telling me what is your favorite item in my Etsy shop. Please be sure to leave me an email address, Etsy shop username, or another way to contact you if you win. Leave me a separate comment if you follow my blog already or are a new follower for one extra entry! Blog about my giveaway and leave a link to the blog post for two extra entries! GiGi scarf is my favorite - thanks for hte opportunity! I really love the Kabibe Crocheted Hat--though it was difficult to choose from among all of your gorgeous pieces! 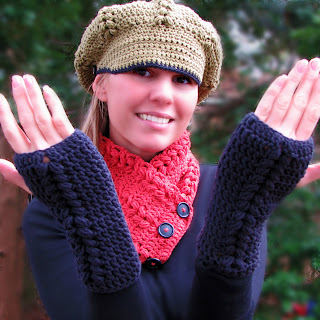 I love the Gigi Newsboy Hat, Scarflette and Wrist Warmers! I adore the Kabibe crocheted hat! Generous giveaway! I'd love to try the Wool Crochet Cable Hat. Thanks! I love the Naomi Crocheted Hat! Everything is so cute, but I especially love the Olathe Crocheted Hat. I love the Anna Cactus Green hat - the color is perfect! jalena hat :) so cute!! I love the Olathe Crocheted Hat, it is so pretty! I am a new follower of your blog-yay! I love the Naomi! Fabulous! The llys scarf pattern is my favorite and quite a few others, but thats my pick. Hard choice huh! Cute hat and nice shop! I like the Dish hat! Thank you! The babbette pin is beautiful. everything is so trendy and warm!! The taupe scarf is one of my favorites--i was looking for the wristy hand warmers, but couldn't find them? The ones in the pic are CUTE. The Olathe hat is also adorable. My favorite item from your etsy shop is the Naomi Crochet hat! The Naomi hat with visor is fabulous! I follow your blog Viki! NEW Olathe Crocheted Hat is my fave. It looks SO soft and cozy. I would LOVE to win this hat as my hair is super thin from chemo. I love the Naomi Hat. I really like the Kabibe Crocheted Hat; I have a hard time finding hats that fit on my wee head! My favorite is the Faina Scarf. I love the Gigi hat!! You have beautiful items in your shop! The linen crochet dress is gorgeous! My favorite item is the Naomi hat. I love the Anna hat! It's so cute! The lime green scarf is my favorite!! So Pretty!! I like the Naomi Hat Easy Crochet Pattern 2in1 With visor! I can't chose between the newsboy and Naomi hats! I love the Crochet Top although it's probably too small for me so I would pick the superwash chocolate brown scarf! I like the diah scarf! I like the Gigi set. I love the Naomi Crocheted Hat. Thanks for the giveaway! I love the Bubble Hat Crochet... Merry Christmas! I like the gigi scarf. I love the olathe hat! My favorite item is the Kabibe Crocheted Hat. Everything is really cute!! I think the crocheted pendants are really unique and interesting! Very cute!! I love the Jalena Hat! I'm a follower now as well :) Thanks! I like the Kabibe Crocheted Hat! My favorite item is the Gigi Wrist Warmers. They would be so helpful for my job when I have to take pictures outside in Minnesota during the freezing cold winter months! I love the Kabibe Crocheted Hat! Thanks for the chance to win. You have such talent!!! I love the Kabibe Hat and Wrist warmer set! I love the Naomi hat! I can't make anything that cute yet. I like the Gigi Adult Newsboy Crocheted Hat & the Lalita Mittens.